What Color Bedding Goes Great With Gray Walls? Deciding what color of bedding will go best with gray walls is easy when you focus first on the bedding design. Most bedding ensembles will go great with this wall color as long as you select the right value for color intensity. This bedding choice is highlighted by the light stone-gray walls, giving depth to the bedroom design. The Boho style bedspread features horizontal patterned stripes in mustard and light gray for a chic look. These two colors work well together since they have a similar depth of color that provides a rich and warm color effect. The iron bed frame supports dark gray pillows and sheets. White accent lumbar and neckroll pillows give a nice contrast to the mustard and steel colors while repeating the white accent color in the bedspread. What Color Bedding Goes With Green Walls? What Color Bedding Goes With Beige Walls? This wall features a unique relief pattern of shapes that immediately grabs your attention. The medium shade of gray on this wall is the color of sculpting clay. The same hue is repeated in the round pillow and the bed throw. The color palette centers on the striped candy-colored pink, brown, gray and yellow pillows. The striped pattern of the throw pillows is repeated in coordinating the lampshades. The pink colors of the bedding and bedside lamps flow naturally to the pillow colors. The dark slate pillow ruffles lead the eye to the artwork on the wall behind the bed. The backdrop of the wall provides a nice color to showcase the bedding ensemble. The focal point of this bedroom design is the orange accent pillows contrasted by the dove gray wall color. The wall and bed colors are separated by a chocolate brown headboard. This color is repeated in the furniture and window frames. 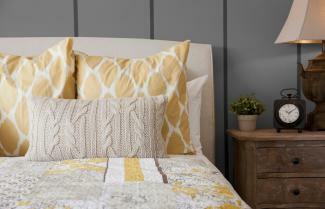 The bedding is a great match since it repeats the dove gray and orange colors in a mix of geometric patterns. This design works since the gray and orange colors are contrasted by the chocolate brown circle patterned chairs and dark headboard, furniture and window frame finishes. Upon entering the bedroom, attention is drawn to the color coordinated stack of books and then to the bed pillows and wall colors. When you use two colors together, think about using lighter and darker values of each to add depth to your design. This bedding ensemble has everything, from the perfect color pairing to the right combination of patterns and solid colors. The light-colored gray walls contrast with the darker values found in the bedding ensemble. The headboard features a different stripe pattern that coordinates well with the bedding fabric and wall colors. Three matching plaid pillows are backdropped by solid color pillows. 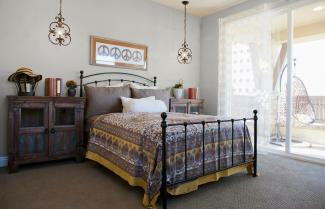 The bedspread provides a darker color that helps make this a truly relaxing bedroom design. Linen gray is the focus of this bedding design, paired with an eye-catching contrasting steel colored wall. This technique provides a great visual between a darker wall color and a lighter headboard. The lighter color is repeated in the gray colors of the bedding with white bed pillows peeping out from behind the large pillow shams. The pale gold and white geometric sham pillow pattern breaks up the stripe and floral quilt design. Texture is created with the addition of a sweater knit fabric used for a lumbar pillow. Drape a soft linen-colored throw at the foot of the bed and this sophisticated bedroom design is complete. This soft gray and pale gold combination has a gentle ambience that is very restful, yet also quite interesting. The cabin theme for this bedding features a rustic, outdoorsy pattern set against dark gray walls. 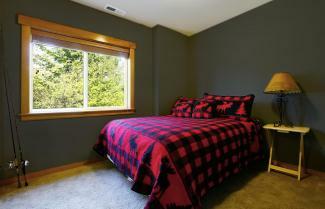 The large black and red buffalo check bedspread features black moose and pine tree silhouettes set against a red background. The moose and tree icons are repeated in the sham and throw pillows in reverse colors, with a black background and red silhouettes. The combination of red and black bedding set against the dark gray walls add depths and a cozy ambience to this rustic design. It's easy to match paint colors to your bedding, so select the colors you want and then match the right gray, either light, medium, or dark depending on the amount of contrast you wish to create. 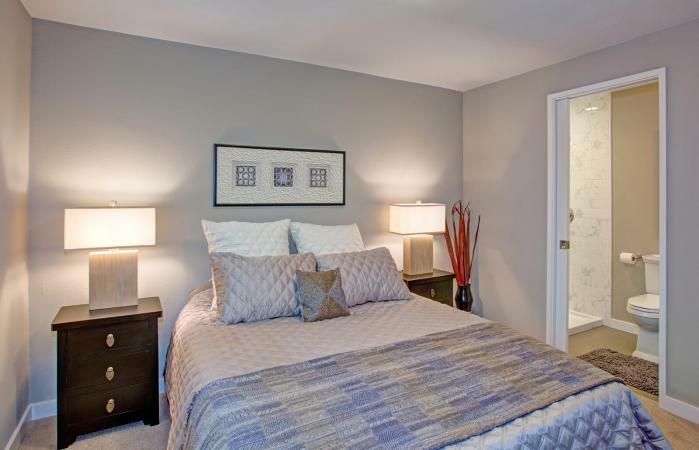 Most bedding colors go well with gray walls since it is a fairly neutral color. If you use color values to create contrast and repetition, you'll end up with a cohesive and unique bedding ensemble.